Added on March 9, 2019 by rebecca kanfer. 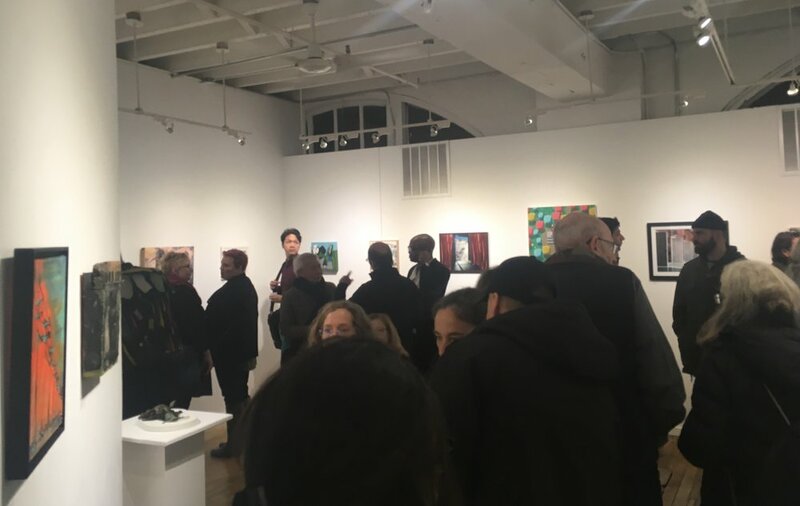 A few photos from a wonderful night of art viewing and conversation at @atlanticgallerynyc! Painting Selected for the Atlantic Gallery's 2019 Juried Exhibition, "ESCAPE/ISM"
Added on February 12, 2019 by rebecca kanfer. “In Dreams Begins Responsibility,” artists may consider Escape/ism as a staging ground for renewed engagement with the Real World. Please join us to celebrate at the Opening Reception on Thursday, 19th February to see works that will make you contemplate or possibly even question your reality! Through the Trees, Oil Painting on exhibition at the Atlantic Gallery soon! Added on January 14, 2019 by rebecca kanfer. These works individually and collectively seek to evoke a sense of quiet and serenity, and capture the universal yet intimate experience of specific landscape typologies, through use of color, day-light-time, and sense of movement or stillness. The horizon line plays an important role serving as an anchor within the image, and additionally in several paintings provides a datum for continuity between the image set. I began with a series of abstracted color studies, created as digital images, which are based on a collection of landscape photographs. These are labeled based on “time of day” or “light descriptions” in an attempt to categorize and group the photos into series. (Above) A series of digital color studies taken from photographs (from left to right): night/dusk/daytime, stormy palette, sunset palette, sunset color study for individual painting. Each painting is the culmination of many hours, days, and years spent observing daily or seasonal patterns of my immediate landscape. For example, the oil painting “Urban Lights: blue orange grey” comes from many cycling journeys through the heart of New York City up to the Palisades in New York and New Jersey. Often times these trips begin early - as dawn stretches and glows across the horizon; the journey then ends in quiet dusk with the backdrop of racing beams of light passing from all directions. This painting captures the multifaceted energy of the city and connection to elements of the natural world. It provides the opportunity for quiet, stillness, and reflection amongst the hectic frenzy of urban movement and life. The series includes abstracted scenes covering a spectrum from urban to deep forest. In each there are lyrical moments which speak to life and human connection. A horizon line across the works provides a consistent datum, and indicates the fundamental connection between even the most disparate landscapes. Added on September 4, 2018 by rebecca kanfer. Please show your support and visit the Long Island City's group exhibit starting this saturday, september 8th through 30th. My mapping painting "gantry park" was selected to be in the show! Added on April 5, 2018 by rebecca kanfer. The painting, My Wish, was inspired by an experience from a fall afternoon in early November several years ago. It must have been unseasonably warm, because I was out on my bike riding through the borough of Manhattan. Traveling towards the Brooklyn Bridge, a bike path carried me into City Hall Park. I felt transported as I passed between elegant limestone buildings and mature shade trees, along a cobblestone pathway. To my left - a stunning pair of ginkgo trees don their brilliant yellow hues. It was just days before the leaves would drop. Completely enthralled, I stop and sit on a bench across from them to take in the beauty of the trees. There is an incredible sense of strength, history, and wisdom from this spot. Surrounded by memorials from the Revolutionary war, stately buildings over two centuries old, and the ginkgo trees which are many decades old and will likely exist many decades beyond my lifetime. Ginkgo trees carry symbolic meaning for eastern and western cultures including hope, peace, strength, and longevity. They are a pre-historic tree species with ancestors that survived the ice age, the blast of Hiroshima, as well as dramatically changing climatic conditions over hundreds of millions of years. In their presence, it is possible to see this history embedded in the very structure of these trees. The roughly textured cool gray bark, the angular shaped branches with alternating nubs that sprout bunches of leaves in the spring, and the fan-shaped two-lobed leaves speak of an entirely different age. In their presence, I feel transported. This painting developed over the course of a year, and evolved as I came to better understand this pair of ginkgo trees and what they represent. During the process I also created watercolor study paintings to explore the sense of light, architecture, and form and texture of the leaves/branches of the trees. These studies helped inform my approach for the oil painting and my language for describing the trees within their environment. Added on January 28, 2018 by rebecca kanfer. This painting came from an experience cycling in Westchester, NY and south-western Connecticut in late summer of 2017. This painting shares a memory of rolling hills lush and green, dappled shade from trees along a quiet country road, and the vibrant bold color of dahlia blooms in flower fields. Added on October 19, 2017 by rebecca kanfer. new this week - an incredible collection of over 300 public art sculptures are scattered throughout the five-boroughs. i knew this was coming soon, and was pleasantly surprised to stumble upon this one in washington square park. a cage-like structure placed within the triumphal arch, has created a barrier within the historic landmark. as much of weiwei's work - it speaks to a theme of immigration struggles, artificial barriers and identity, while reflecting on the layered history of each selected site. the success of this installation is its ownership of the space, forcing us to experience and interact with our environment differently. new yorkers walk an unconscious line every day, which is now blocked or obscured. the mirrored central arch gives us the opportunity to pause for a moment and become aware of the reflections of ourselves and those around us. as with most successful public art works - the "arch" brings us together to share in a collective alternative experience. Added on February 8, 2016 by rebecca kanfer. Added on March 22, 2015 by rebecca kanfer. one sunny afternoon this past june i found myself strolling with a friend on the elevated park, the high line, in manhattan. a southern section of the park, around 23rd street, has a water feature that invites passersby to cool their feet. a trickling flow of waters steadily runs across a 50 foot length of paved area, disappearing between skinny gaps between the paving. walking through this urban brook, is the most wonderfully refreshing feeling on a hot summer afternoon. on this particular day there was a young girl, equally thrilled by her discovery. My friend and i sat on a bench, with bare feet placed in the water, watching this girl skip back and forth in the water. she giggled and was beaming with the same joy I remember from playing in a sprinkler when I was a child. the girl's joy was so genuinely charming, people paused to watch her play, and continued on with a smile on their faces. it is amazing how something so simple can be so wonderful. 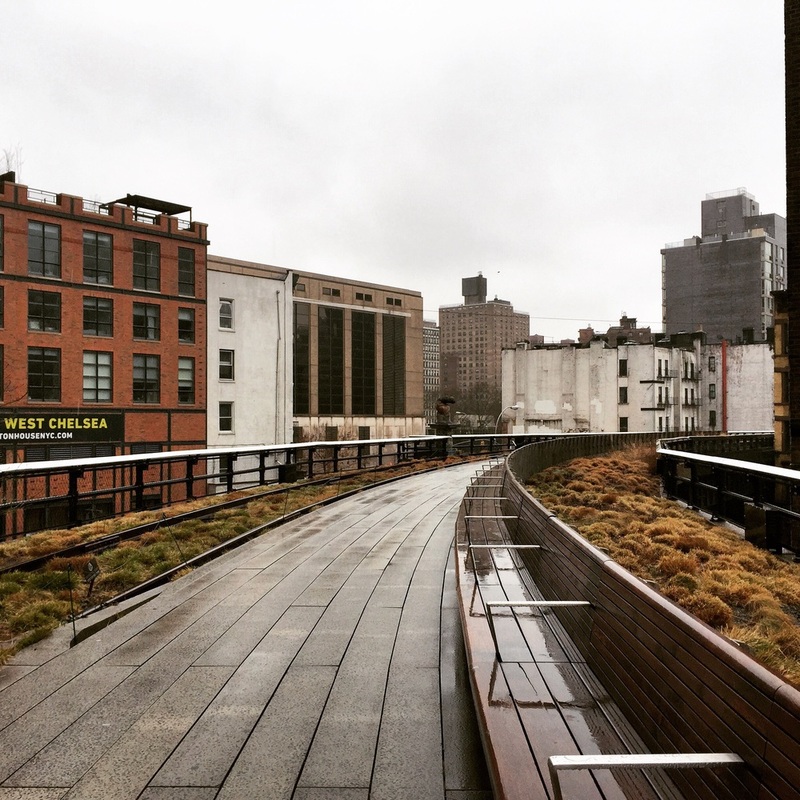 the first day of spring has just passed, and the Highline is still in hibernation. if you look closely there are hints of life, and much to enjoy. witch hazel is one of the early bloomers in the north east. these tiny blooms of orange and yellow pop out in late februaury to march, and give hope of what is just around the corner. 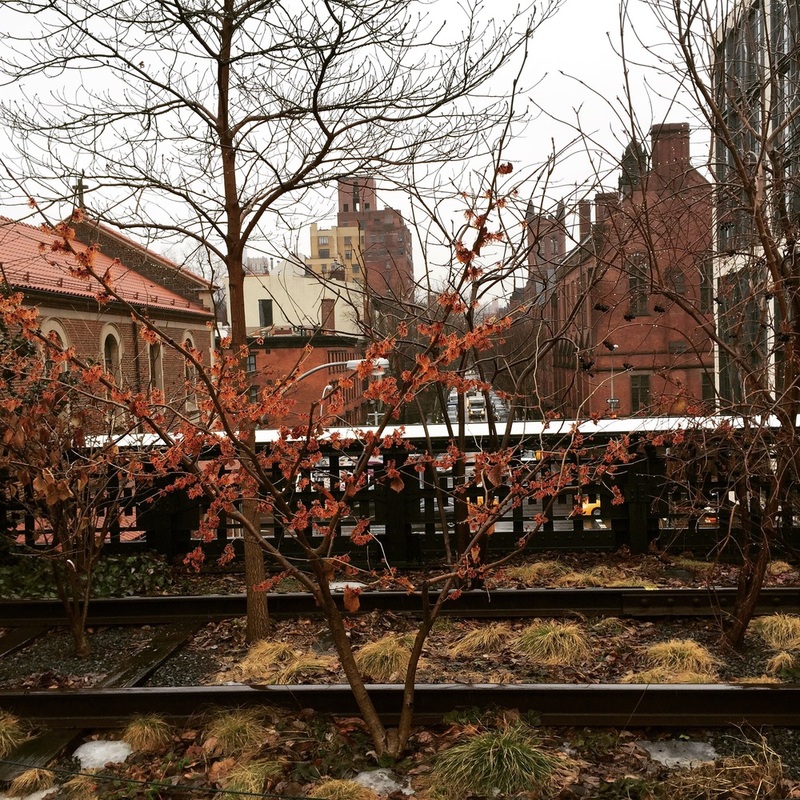 in parks of manhattan we are beginning to see more views like this; grasses in the winter. traditionally considered unkempt when allowed to display it's wild and floppy characteristic, the grass in this view is stunning. reminiscent of a roadside field, tossed around by the wind. Added on November 25, 2014 by rebecca kanfer. Please join me for this exciting event showcasing my paintings and the work of over 40 local New York artists! Tickets are $15 and available at the provided link. Added on May 24, 2014 by rebecca kanfer. lost landscapes: shares the practice of Rotterdam landscape architects LOLA, and provides perspective of contemporary urban landscapes that are forgotten, derelict, and hold potential to change. Added on November 12, 2013 by rebecca kanfer. Recently, I visited the MFA in Boston to see the current exhibition of 'Sargent's Watercolors.' I came seeking inspiration, seeking something to help me move forward in my own work. I was not disappointed. John Singer Sargent is known primarily for his stunning portraiture work of prestigious individuals and their families, including 'Daughters of Edward Darley Boit' (1882), which can be found in the Boston MFA, and the portrait of Isabella Stewart Gardener at the Isabella Stewart Gardener Museum. These paintings typify the control and technique which distinguished Sargent in his time, with a special artistry for composition and capturing of each individual's character in a single scene. There is an atmosphere created through every detail of these images to portray the subjects as desired, but to also provide a window into the vision of the artist. This exhibition is special because it focuses on a different aspect of Sargent's tremendous body of work, watercolors. Sargent treated watercolors as an exploratory medium, in which he captured a great breadth of scenes in his travels - from Roman architecture and city streets and canals of Venice, to rolling hills of the english countryside, the Middle East, the New England Coast, and Florida. For many years he merely collected stacks of these paintings, giving some away as gifts; it wasn't until later in Sargent's career that he decided to exhibit and sell collections of the watercolors. Each of these Sargent paintings or sketches are characterized by vivid, fine tuned, and bold color palettes; confident brush strokes, approached with intensity and obsession, to capture each scene of inspiration. In this exhibition with dozens upon dozens of Sargent's beautiful watercolor paintings, two paintings in the exhibition proved to be especially memorable for the subject matter, technical execution, and the intentional portraiture of subculture in the early 20th century. 1. 'Santa Maria della Salute' offers a non-traditional view of the Roman church, portraying its stature and tremendous architectural detailing, juxtaposed by fisherman's boats hovering in the foreground. A closer examination of the painting reveals a light layer of pencil lines to organize and layout the scene. These marks are expressed with careful precision, before the rich layers of paint are applied - I am told Sargent typically does so in a continuous manner. Never allowing the paint to dry completely. There is an apparent difference between the application of paint for the architecture versus the fisherman's boats. The church lends a warm subtlety and richness of detailing, whereas the boats in the foreground give an impression of detail through bold and confident placement of layered brushstrokes. Warm washes of ochre with smudges of earthy burnt umber and cerulean blues describe swaddled fabric of a collapsed sail or spare clothing awaiting the next journey. This juxtaposition, stoic architecture in the background with evidence of daily life in the fore to activate the scene, is what moves the piece beyond simple observation and makes it compelling. In such compositions we can observe layers of culture, contradictions of everyday life, and make conjectures as to how they were able to coexist. The image calls you in from across the room with a quiet reverence, then draws you closer - revealing more layers of complexity with every step. I follow the washes and brush strokes across the page, trying to discern how this was constructed, and in what order the colors were placed. Background to foreground, transparent to opaque, warm to cool. One might think so, if not for the discernible scrapes and smudges to deduct color from areas. In a fervor, it is likely that Sargent was activating the entire canvas with his mark-making - as a ripple can so quickly carry across the surface of a body of water. This is the beauty of Sargent's Watercolors. The lizzatori, the men whom mine the precious stone, ascend the mountainous stairway towards another day of hard labor. Sargent is obviously enraptured by the colors reflected off the pale mountain-side; warm ochre ledges in the sunlight cast purple-blue shadows below. In this piece the mountain is in the foreground, demanding the spotlight for its natural beauty and reverence, and the men play a supporting role to the composition as they slowly disassemble and sell the very ground beneath them. This body of work is a source of inspiration and hope; an intimate collection which shares one man's investigation of landscape, exploration of color and light, and evolution of understanding through a lifetime of observation. I am not sure whether it is the transportive scenes from around the world, or my respect for Sargent's determination to follow and exist within his passions of painting. Added on September 17, 2013 by rebecca kanfer. I have been working though this painting for several months now… technically the canvas began in 2007 and the image has changed many times. Currently I am using this 36in x 48in stretched surface to explore the phenomenon of the MassPike interstate, as it passes from Newton into Boston. The incarnation of the interstate highway in the 50’s – 60’s is fascinating - for the lofty vision initiated by Robert Moses, as well as the devastating effects it carried for many communities who lost their homes, businesses, and cultural groundings. Many cities have been stricken by this shortsighted growth, which began as a grand vision for connection, fluidity, and convenience, ending in destruction, congestion, and separation. From a ground level, human perspective I was drawn to the Interstate-90 (I-90) overpass in Boston at the Massachusettes Avenue bridge. This is a complex transit intersection,; comprised of a Green Line T-Station, where exiting passengers find themselves surfacing from below ground to street level at a vibrant and noisy intersection. Wizzing across the bridge are cars, buses, bicyclists, skateboarders, and pedestrians. Some people are stationary – waiting for the bus, a friend… or perhaps just for time to pass. Others are moving hurriedly with a purpose, a destination, someplace to be and very little time to get there. Sitting on a bench across the street, a lone guitar picks at a struggling melody, barely audible over passing engines and bands of car horns filling the air. I turn left out of the subway door, and am immediately sucked into a vortex of lights and the whooshing of autos passing beneath my feet. This excavated trench with cars traveling at high speeds feels almost futuristic. I am watching a light show – of white and red. The exposed beams just in front of me are glowing warm light beneath. Looking the other way, I see a river of color describing the contours of the city. The streams of light disappear far in the distance as they are absorbed by dark looming structures, reminiscent of a great canyon. The sky beyond holds brilliant bands of warm yellows, pinks, and reds, radiating from an intense point along the distant horizon. I am unsure as to what is captivating my attention in this overwhelming sensory experience. There are sounds of life all around, gusts of wind as large trucks pass beneath, lights glowing and flashing in every direction, and the smell of musky cologne as a couple returns to the subway after having spent their evening swooning over the smooth melodies of string and brass. At first it is the sharp horizon line described by the geometric canyon. But this could only hold it’s edge with the radiating bands of color beyond. Setting oh, so slowly. My attention follows a series of directional lines, metal edging which provide a strong sense of perspective and depth at the base of the canyon. With graphic studies I try to pull out aspects of this view and experience, to better understand the essential elements of this experience to include in my painting. Currently it the painting is overwhelmed with an excess of sensory elements… similarly to how I feel every time I step onto that overpass. There is an immediate rush of adrenaline as I am hit by the sounds and smells and feeling of exposure – standing over the canyon. I imagine the canyon as something other than an auto-route… perhaps it transforms into an ecological corridor, a recovered extension of the historic bay area. Providing a corridor of flux for the rising and setting tides, and softening the hard edges of this overwhelming experience. Added on August 25, 2013 by rebecca kanfer. after a weekend of gorging myself on delicious food with friends and family i felt the need to spend my sunday afternoon cycling through the countryside. on such a clear, crisp, and sunny august afternoon what could be better? my favorite area to ride just outside of boston is the lincoln / concord area. you get winding country roads, rolling hills (the fun kind! ), conscientious drivers, and gorgeous scenery. who could ask for more? well, another benefit to riding in this area (as many cyclists already know) are the multitude of organic farms, community gardens, and agricultural fields. seriously, they are EVERYWHERE. there are also incredible cultural sites including the Mass Audubon Society’s conservation land and wildlife sanctuary, the DeCordova Museum and Sculpture Park, and uber popular historic sites such as Walden’s Pond – home to Thoreau and Emerson as a tranquil place for life and contemplation. every time i ride through this area, something new is uncovered and i realize how much is yet to be discovered. it is quite wonderful, really. today, while coasting along route 117 just past the Mass Audubon Society, i looked to my right and was struck by a large field of wildflowers. this was not your typical field, as it is a linear, cultivated flower field. The Food Project, a non-profit organization which provides community farming / gardening opportunities to the greater Boston area, has 27 acres of land for farming and community education in lincoln, ma. this series of fields are part of the "project." Added on August 14, 2013 by rebecca kanfer. this painting began to materialize in my mind at a very young age. as a child my family traveled to visit my grandparents in upstate new york every other weekend. by my college years it seemed i had traversed the same familiar sequence an infinite number of times; gazing out the window from the back seat of my parent’s minivan. despite this repetition, there was always something new to see – some discrete or unmemorable stretch of road yet to be discovered (or rediscovered). en route, we traveled down your traditional rural vermont roads – long and winding through patches of woodland and then straight past large expanses of cornfields and cow pastures. in milton we would hook left toward the champlain ferry in south hero, traveling for several miles before getting to my favorite part. roosevelt highway/rt.2 is the road that connects rural vermont to its largest island on lake champlain, south hero/grand isle. sand bar beach is part of a 1,000-acre wildlife refuge, which consists primarily of marshland and is a popular nesting area for a variety of migratory birds, turtles and other animals. all I new as a child was that it was beautiful. after passing through the marshland we would traverse open water on a narrow road. i loved to stare at the reflection of the rippling water as distant fisherman and sail boats glided lazily across the surface. just before reaching the open water, clusters of trees provide a frame to capture the glorious green mountains beyond. 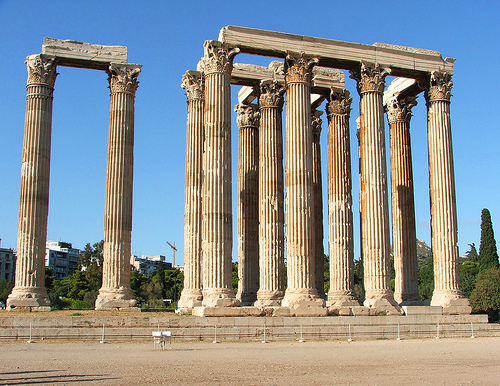 over the years these vertical columns became engrained in my memory, equivalent to the beauty and strength of columns in classical greek temples. what make the trees unique are their structure, size, and positioning... or lack of positioning. and depending on the time of day and lighting, these pieces of living architecture could become objects of focus in the foreground, or mere silhouettes to frame the scenery behind. i still visit my grandparents quite often, and have made a few bicycle trips out to the sand bar. this painting was formatted from a photograph I took several years ago, and evolved over the course of 18 months based upon a (half) lifetime of memories. Added on August 8, 2013 by rebecca kanfer. Added on July 27, 2013 by rebecca kanfer. I really enjoy seeing events like this. Talented artists put together a cool and accessible art showcase. Added on July 26, 2013 by rebecca kanfer. Do hand rendered images and representations still have value in the field of Landscape Architecture? For at least the past several years Landscape professionals have been involved in a game of catch-up in order to remain at the front end of rapidly changing technology and production systems. Everything is changing - from how designers brainstorm and represent ideas, to the production of documents for planning and construction, to the materials and process of construction. I constantly find myself asking questions about what drives the value and necessity of these technological upgrades? And is it necessary to continue to utilize visual thinking and brainstorming skills such as sketching? I would like to highlight the practice of sketching, and provide an example of how it still holds value for design professionals. 1. To learn about cool new projects and follow project discussions. 2. Because when I am feeling uninspired I know that there is something on Land8 that will inspire me. 3. To understand and learn from perspectives of practitioners, students, and educators from around the world. I recently found a posting about the "4th International Urban Sketching Symposium" in Barcelona. Participants from 30 different countries gathered together to celebrate sketching. The discussion itself is not provided, however a sampling of beautifully sketched street scenes are shared. I am interested to hear other ideas of if and why sketching should be maintained as a standard practice for Landscape Architecture and design professionals. Added on June 27, 2013 by rebecca kanfer. the channel continues to transform. a bridge overpass becomes an energetic strip of color and movement... the highway below also breathes new life. Fluctuating water ebbs and flows within the recessed channel. Terraced forms sculpt the edges, while history is carved out along the ground surface.